Unseasonable weather certainly wasn’t going to stop this group. They boasted strength in numbers and an undeniable determination to make a difference in the community. 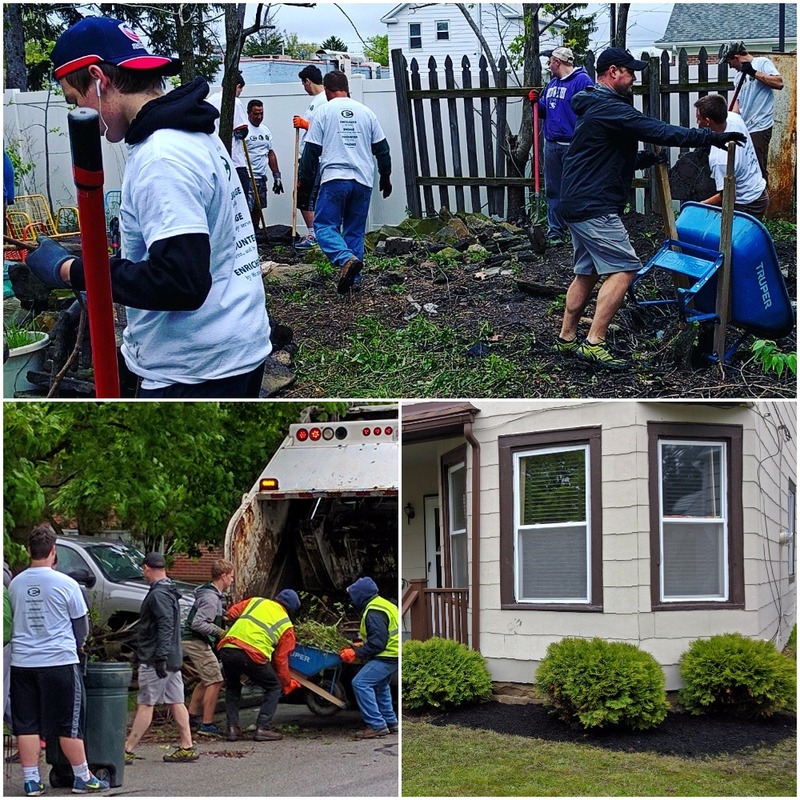 A sizable contingency of volunteers from St. Edward High School and Lakewood United Methodist Church gathered in the city’s Historic Birdtown Neighborhood on Saturday, May 14, in an effort coordinated by LakewoodAlive. Unfazed by the chilly temperature and periodic rainfall, the group – 75 strong – collectively spent an estimated 300 volunteer hours completing four simultaneous curb appeal projects within the proud, working-class neighborhood. The collection of students, parents and alumni from St. Ed’s tackled three beautification projects on Coutant Avenue. They mulched flowerbeds, removed debris from a former koi pond and planted hydrangeas and other greenery. Cleaning an overgrown backyard, the volunteers filled two tree lawns with refuse for the City of Lakewood to dispose of – all while preserving existing flowering trees. St. Edward High School volunteers complete one of three projects on Coutant Avenue. Meanwhile several blocks southwest of Coutant on Dowd Avenue, a group from Lakewood United Methodist Church overhauled a front and backyard for a grateful Birdtown resident. The dedicated group cleared debris, trimmed overgrowth and landscaped their way to a beautiful finished product with highly-visible curb appeal. 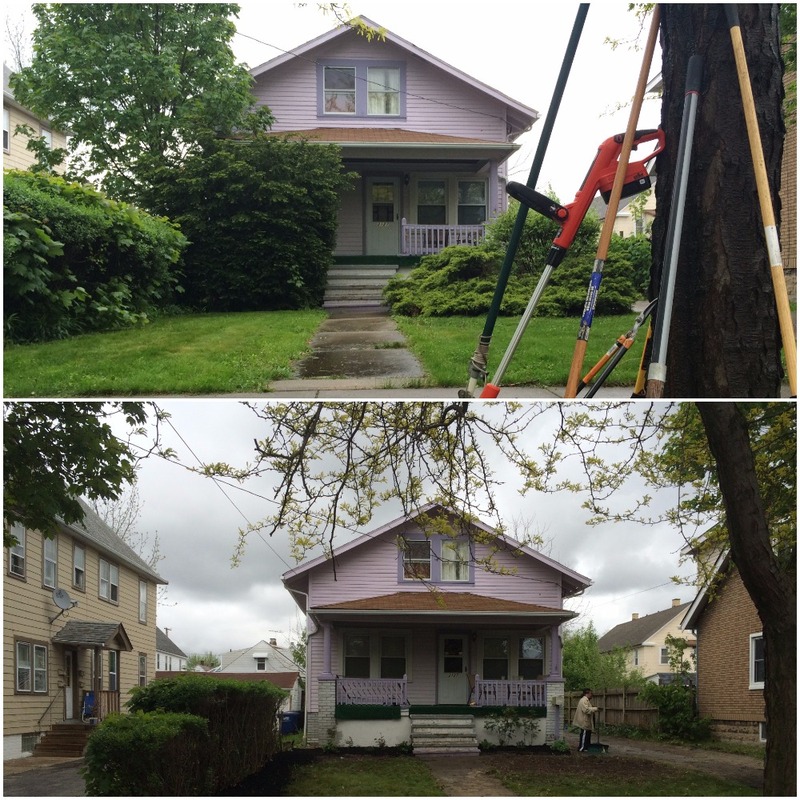 A before-after comparison from the volunteer project on Dowd Avenue. 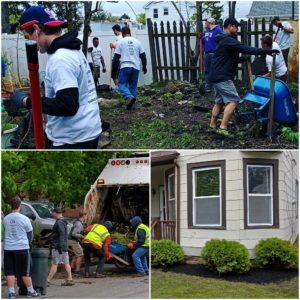 The annual volunteer project was spearheaded by LakewoodAlive, a community-centered non-profit organization striving to foster and sustain the vibrancy of Lakewood’s neighborhoods. LakewoodAlive’s Community Engagement Program offers outreach to homeowners and residents in low-to-moderate income neighborhoods to support affordable housing, cultivate a sense of pride and leverage the power of neighborhood relationships. In this particular case, that shared sense of pride among the volunteers and residents was palpable. The St. Ed’s group celebrated the project’s success with a cookout afterwards in the school’s cafeteria. It was a well-deserved lunch for folks with an appetite for impactful volunteerism.